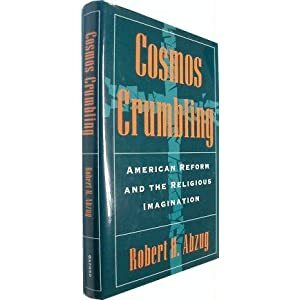 In Cosmos Crumbling: American Reform and the Religious Imagination, Robert Abzug presents the growth and evolution for American reform movements between the Revolution and the first three or four decades of the nineteenth century. He lays out three broad aims for his book: “[f]irst, [he] find[s] importance in the cosmology of the reformers, especially those that encompass a wide gyre than formal theology.” He then seeks to focus on “the religious aspects of reform ritual” and finally he was “concerned with the relation between sacred and profane elements in reform, treating religious dimensions of social and personal life as equal in importance to those of the so-called secular realm.” These aims taken together show that Abzug is fundamentally treating antebellum reform as religious movements with primarily religious concerns and origins. With a prologue in the early reformer of Benjamin Rush, Abzug traces the development of reform from the “New Divinity” of Timothy Dwight, to the powerful evangelism of Lyman Beecher, to the passionate and energized work of Charles Finney, to its most radical forms in the strident nature of Garrisonian abolitionism and the women’s right movement. There are two “cosmoses” that crumble in Abzug’s book. The first is the “cosmos” of the stable, unified New England established churches that existed from John Winthrop to the first decades of the nineteenth century. In the wake of disestablishment a new “cosmos” rose in the form of evangelicalism articulated by Timothy Dwight and Lyman Beecher. This new cosmology was non-denominational and began to move the religious impulse from the churches and society and into individuals and voluntary organizations. This “cosmology” began to crumble as some factions of this new evangelicalism became more and more radicalized. The Garrisonians and women’s right’s activists moved evangelicalism in more individualistic, secular, and totalizing directions that pushed it further from traditional denominational structures and challenged many cultural, political, and economic ‘sacred cows’. These innovators divided the evangelical reform movement and eventually shattered its unity. It is from this final “cosmological” crumbling, in Abzug’s view, that we get modern reform movements such as anti-war and environmentalism. In Abzug’s telling of the reform story, with these “cosmological” innovations came changes in who was spearheading reform. Radicalization moved the energy of the movement from established ministers like Lyman Beecher to freeform and free-floating preachers like Charles Finney and finally to lay people like the Grimke sisters, Garrison, and the Tappan brothers. This shift brought increasing criticism from outside the movement and increasing division within in it. Abzug is intervening the historiography in two places. First, with his primarily religious and “cosmological” focus Abzug is arguing against a strain of the historiography, prevalent in the 1980s and early 1990s, that explained the rise of abolitionism entirely in terms of the rise of capitalism and the industrial revolution. He also arguing against broader works, like Paul Johnson’s excellent Shopkeeper’s Millennium, which seek to explain the rise of antebellum reform in almost entirely materialist terms. To Abzug, the starting point for antebellum reform and its primary concerns were religious. This assertion is not entirely convincing. The interplay of religious ideas and concerns with more profane ones is far more complex and complicated than Abzug’s formulation would have it. Abzug’s relegation of discussion of material forces and concerns, like social disruption and social control, single sentences and footnotes flattens out the world of these reformers. It really prevents one from being fully convinced by Abzug’s religious understanding of antebellum reformism. The second historiographical arena where Abzug is intervening is in the notion of “Christian Republicanism.” Historians like Nathan Hatch and Mark Noll have argued that a merging of Christian theology with republican ideas and governance powered much the political and theological culture from the Revolution to the Civil War. Abzug argues, however, that “Christian Republicanism” was a failure and dead by the very beginnings of the nineteenth century. He makes this argument by highlighting the early republican and Christian reformer Benjamin Rush. According to Abzug, the failure of Rush’s reform efforts in Philadelphia and his late-life disillusionment can be explained because he made a major “folly” by combing republican ideology and Christian reformism. In Abzug’s view, later reformers had more success when they jettisoned republicanism and addressed themselves primarily to religious forms and discourse. This argument is more persuasive than his argument against materialism. However, after his chapter on Rush, addressing “Christian republicianism” is a background theme for Abzug. His book would have been stronger if he had more explicitly addressed this issue throughout the rest of Cosmos Crumbling instead of just with his Rush chapter. Overall, Abzug presents some interesting and compelling arguments as he lays his story out. His chapter on Benjamin Rush, as noted above, is compelling and his argument that “no vision but Garrison’s seemed quite equal to the task” of coming to terms with the Civil War is very interesting. However while reading Cosmos Crumbling it is sometimes difficult to understand exactly what Abzug is trying to argue. Some reviewers have noted that Abzug plays fast and loose with terminology – such as “cosmos” and “ritual” – without providing clear definitions. However, I would argue that it goes beyond that, to a level of general obtuseness. You wouldn’t be able to tell without at least some knowledge of what Abzug is talking about, but what Cosmos Crumbling is really discussing is the importance of millennial thinking in the worldview of antebellum reformers. With the importance of millennialism to Abzug’s “cosmological” viewpoint, he is bringing Ruth Bloch’s Visionary Republic fully into the nineteenth century. Abzug’s reformers millennial vision was one of ‘perfectionism’, or the belief that human works could perfect society by removing sin and thus usher in Christ’s rule on earth. Thinking of Abzug’s book as highlighting the relationship between antebellum reform and Christian ‘perfectionism’ clears up a lot of things in a book that sometimes feels like it just seeks to cover old material in a new “cosmological” gloss. Fundamentally, one wonders what new is gained from reading a book that shows how religious movements understood society’s problems in primarily religious terms. One does not get a huge sense, as they plow through Abzug’s difficult prose and sometimes-obtuse argumentation, that there are things that are particularly new in Cosmos Crumbling. It is that feeling that really weighs the book down and limits its appeal and value to the historiography of antebellum reform. One might be better off reading later synthesizes of reform and specific monographs on various reform movements and reformers. Particularly, if one is interested in African-American reform or reform beyond New England, New York, and Philadelphia. Robert H. Abzug, Cosmos Crumbling: American Reform and the Religious Imagination (Oxford: Oxford University Press, 1994), viii. Abzug connects antebellum and modern reform in, Ibid, ix. For Abzug’s dismissal of this historiographical strain see: Ibid, viii & 231n2. This argument is most powerfully put forth in Mark Noll, America’s God: From Jonathan Edwars to Abrahm Lincoln (Oxford: Oxford University Press, 2002), esp. 73-92. For Abzug on Rush see: Cosmos Crumbling, 11-29, esp. 28-29. This is drawn from: F. Michael Perko, “Review of Cosmos Crumbling,” Review of Religious Research 37, no. 2 (December 1995): 167-168. Ruth Bloch, Visionary Republic: Millennial Themes in American Thought, 1756-1800 (Cambridge, UK: Cambridge University Press, 1988).